Endorsements… those fun little squares, so nicely filled with people’s faces. Those mind boggling emails you get telling you that someone you barely know endorsed you for something you KNOW they have no idea you have any talent in. Maybe you have done that too, I understand! It’s so easy to click, click, click, adding endorsement “kudos” to your fellow connections, it just feels like you are doing something good! 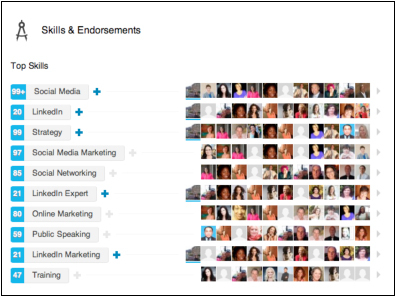 What is a LinkedIn endorsement really for anyway? Well, just like everything else, there IS a strategy behind this chess board and I’m going to tell you what it is and what to DO. First and most important item to know: LinkedIn uses these skills terms as keywords in their search algorithms to make sure the people who are searching for those skills, words, and knowledge find YOU. That’s why you must ensure the keywords you have worked so hard to use in every other space of your LinkedIn profile show up here too! Take a look right now, I’ll wait. Do you see all of your keywords in some fashion or another in your list of endorsement skills? If not just click edit profile, click edit skills/endorsements and locate that long white box under Add & Remove. Enter any additional areas of expertise aka keywords here and click Add! Second, move what you most want to be known for to the TOP. Take a look at my screenshot above. All of these skills are my expertise, what people look to me to teach them, and what I want to be known for. Do yours show the same? Don’t let the fact that Bob Smith who connected with you 6 months ago and decided to endorse you for something he remembers you used to do 5 YEARS ago get in the way of what you want to be known for now. Be consistent with how you are presenting yourself and your zone of genius to the world. Constantly work to stay in your zone, it shows you are polished and professional and will get you the work and the clients you deserve. Take 60 seconds and fix it now. Click Edit Profile, then click edit skills/endorsements, then just click and drag each skill “box” around until you have the order you want. 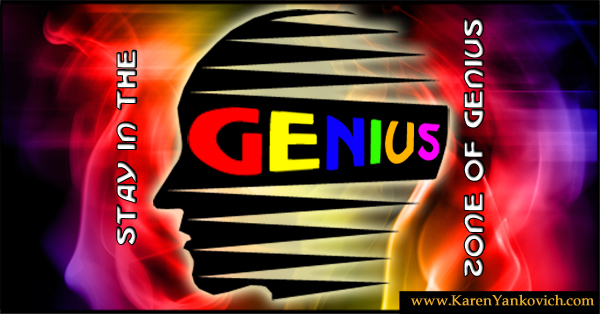 While you are at it remove any skills that don’t relate to what you do now, those skills that take attention away from your zone of genius (Just click that little X in the skills box). Be sure to click Save, and then you are done! Third, and most strategic of all: My sometimes controversial advice is – don’t be shy, ask friends and contacts to endorse you for those specific TOP skills to help bump them up. Heck, ask me! This is strategy, you’re not asking people for straight up recommendations, you’re just asking for some strategic help. 30 seconds: send me a note and 5 other contacts in your list asking for help endorsing you for your top 5 skills. Tell them you will return the favor. Do this a few times a week (to different contacts of course) and pretty soon your skills section will start to look full to the brim with exactly the expertise YOU want to be known for. Finally, set a monthly appointment: Review these skills periodically to make sure they are still on target with your goals. This is a fast paced world we live in, your projects and passions and zones of genius will come and go and change as we evolve in business so make sure everything you do reflects where you are right now. In literally 2 minutes you could be on target and more laser focused with what your LinkedIn profile says about you to everyone who is looking. I challenge you to take these next couple of minutes and make it happen. Want more LinkedIn advice and a group of amazing engaged professionals just like you seeking to conquer the LInkedIn realm? Join my LinkedIn group and get even more help and support!